Proud father Dingdong Dantes has shared on Instagram a photo of his wife and their newborn son. 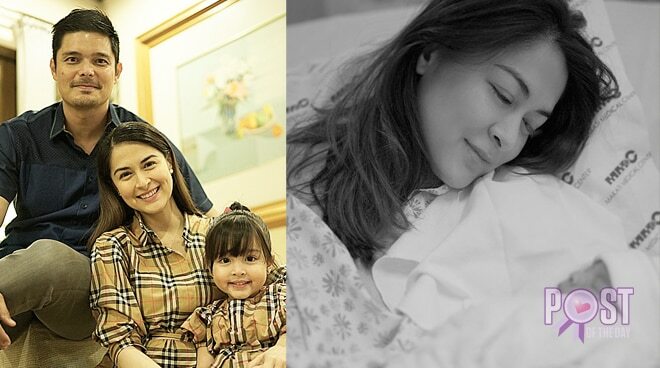 Proud father Dingdong Dantes shared on Instagram that his wife Marian Rivera has given birth to their son this Tuesday afternoon. "Yahoo! After around 10 hours of labor, Marian finally gave birth to our baby boy at 1:35 p.m. today,” he wrote. Dingdong also revealed the name of their son. “Welcome to the world, Jose Sixto G. Dantes IV!" he wrote. Yahoo! After around 10 hours of labor, Marian finally gave birth to our baby boy at 1:35pm today. 😄 Thank you very much for praying with us. 🙏🏻 Welcome to the world, Jose Sixto G. Dantes IV! Dingdong and Marian shared with the public last September that they are expecting another baby. Married in 2014, they welcomed their firstborn Maria Letizia in 2015.